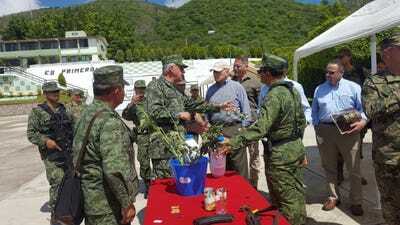 Mexican Defence Secretariat/TwitterCienfuegos shows then-US Homeland Security Secretary John Kelly opium-poppy eradication operations in Guerrero, July 6, 2017. Mexico’s defence minister said Friday that legalization could be a solution to the problem of drug-related violence in the country’s southwest. The head of Mexico’s defence ministry said on Friday that the legalization of opium could help resolve drug-related violence that has spiked throughout the country in recent years. He has criticised that deployment of the military in the past, but his comments on Friday are the first of their kind from a high-ranking military officer.